SIX SETS for the price of FIVE! 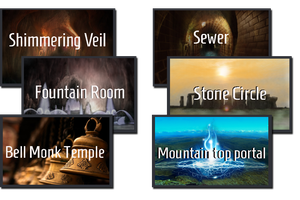 : Shimmering Veil, Fountain Room, Bell Monk Temple, Sewer, Magical Stone Circle, Mountaintop Portal. This SoundPack brings you an amazing collection of some of Syrinscape's most mystical and magically infused locations. Your players will feel 'balanced' and 'transported' after they've spent an evening exploring these environments!